First published in 1986, the purpose of this dictionary is to clarify the technology behind nuclear jargon. The entries deal with all areas of nuclear warfare: its strategies and tactics, personnel and weapons systems, arms control and disarmament talks. The terminology of the nuclear age expands and changes as fast as the weapons and strategies it describes; the dictionary therefore covers a span… ranging from the first tentative post-Hiroshima ideas and systems through to the near-fictions of the 'Star Wars' initiative. 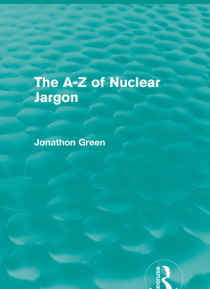 This fascinating reissue will be of particular value to those in need of a comprehensive guide to the vocabulary of nuclear warfare, as well as students of linguistics with a particular interest in slang and jargon.